Plane from Dubai to Amsterdam. Just getting out my laptop out of the overhead compartment made me feel nervous. It means I have to start facing inside what I soon will be facing outside. A mere 48 hours ago I have taken the decision that I least expected I would be taking any day soon. I am on my way to Amsterdam and the plane will land in in 3 hours and 22 minutes from now. By the time you read this I will be back in my home country after 18 months of traveling. What happened? A week ago, on the morning of the 23th of June, I woke up in Hoi An and grabbed my iPhone to check my messages. One of the emails was from my uncle who let me know that he and his wife are organizing a party and that I was invited. His direct words were: “kindly I would like to invite you to our party. Without you we won’t be complete. I hope you will be able to take a break from your Quest and come replenish in our comfort zone. Everybody will be there”. Also he offered to pay for my ticket. Now this is of course a very nice and touching gesture. But then I noticed the party would be in a week! And I was on my way to Cambodia to meet a friend! And obviously I could not go back to Amsterdam to just attend a party and then fly back to Vietnam or Cambodia after – let’s say – 4 days. The gesture was nice but the implications on my current life are huge! My very first thought was that I was not ready to finish my journey. It is not complete yet (although I don’t really know what complete means or what is needed to make it complete). I have said to friends half jokingly and half seriously that I would not come back before I am either rich, famous or enlightened (or a combination of those). I felt shame and fear come up immediately. But I also realized that I was presented with an enormous challenge and that challenges are there to be faced head on. I wrote back to my uncle, let him know how his request blew me out of my socks. I asked for a couple of hours to think. I let him know that I wasn’t saying yes yet but I certainly wasn’t saying no to his invitation either. He responded with apologies and told me his invitation was send in an impulse, without consulting his wife or anybody else and that on second thought the timing was perhaps not perfect. He promised me to not ambush me again like this. Now it gets interesting. I have the choice of honoring an impulsive and heartfelt invitation or I can go along with what the thinking and rational mind tells us what is the ‘wiser’ way and that being impulsive is ‘silly’. I am writing this in the plane so you know what I did. I trusted the wisdom of my uncle’s heart, I honored the initial impulse and I will face the consequences. In a way it makes perfect sense. I could not have imagined a bigger plunge in the unknown than jumping on a plane to Amsterdam without hardly any chance to prepare myself. The only thing I could do and have done is muster up courage. I have no house anymore, no work lined up. I have been traveling all this time and sharing my stories with the world. All my (1600+) contacts received weekly updates. Maybe everybody is tired of me, maybe they have been gossiping about me, ridiculing me for my failures. I fear judgment and the loneliness of feeling misunderstood. But I am sure there are also people who will be happy to see me and vice versa. Either way, I have hardly ever felt so vulnerable. It is strange. I it was scary to go to places where nobody knew me and whereof I was not sure they would be in any way interested in what I had to offer but now it seems even more scary to go back to a place where people do know me. But there are good things too. When I allowed the thought of going back to Amsterdam I realized it would mean I could quite possibly attend the annual summer retreat of my beloved Zen teacher, something I would really love to do. Also I could work on the makeover of my website, something that would be easier done face to face with my designer and programmer friends than through email. I have 2 good friends who both opened up a gym (Evolve Personal Health Institute and The Athletic Club) and I can’t wait to get in shape again. And in general I am just very curious how I will feel. Will I feel changed? Will I feel alienated? Will I feel at home? Will I feel relief for not having to live out of a backpack anymore? Will I receive requests for interviews and find a publisher? Will I find work? Will companies be interested in hiring me as a speaker or facilitator? My vision is to visit Amsterdam for 3-4 months and to work on becoming more professional as a trainer, writer, traveler and – I hate to say it – marketer. I have proven to myself that I can venture into the world without a real plan and not much money. I have learned I can work in many countries under the most difficult circumstances and with all sorts of cultures, religions, ages and backgrounds. But I improvised a lot as I went. When I leave again I want to clearer about my goals. It is not the first time I say that, I seem to be on a lifelong journey to learn to become focused, organized and disciplined. My biggest fear is to get stuck in The Netherlands. I fear feeling so comfortable that I can’t bring myself to leave again. I fear falling into a black hole, finding out the world developed when I was gone and everybody is now ahead of me. But I have faced so many fears, I am sure I will manage these ones too. There is only one way to find out how many of them will come true. Experience taught me only very few do and even then the event is rich in teaching. Now let’s look at the upside! In about 2 hours from now I will be hugging my best friend, she is the only one apart from my uncle who knows I am on my way. That will be amazing. And less than an hour later I will give my mom the surprise of her life. By dinnertime I will have seen all my family members (apart from my brother unfortunately). Then, before I will go to bed I assume I will find time to post this on my blog. If you are reading this: now you know too. Amsterdam, I am back. I hope you are happy to see me. The pic was taken when I just left the plane. The familiar blue and white of the KLM planes and the flatness of the landscape was strangely familiar (just as the unintended reference to Dutch cinema that made me smile). 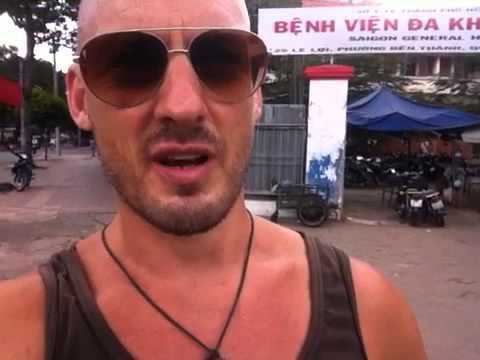 Below my last video from Vietnam wherein I talk about my upcoming journey to Amsterdam and – as a freebie – a tutorial on to cross a busy street in Vietnam (don’t try this at home!). Unless you make it to be, life is never the same from one moment to the next. All good. Now I am real curious to know that in the days to come whether the QUEST or the REST will prevail over the warrior. Being a long distance runner I know its so difficult to stop midway and then start all over again, but then its for we humans and the warrior is a superhuman. WAT BEN JE TOCH EEN KONING! Hi Atalwin, just wanted to say thanks for the wonderful posts, I have been following them for some time now. It is often very inspiring to read your thoughts. I want to wish you all the best on the next step of your journey, back home in the Netherlands. I have been to the Zen Center there and loved the atmosphere. All the best, brother. Welkom thuis/terug? Hmm, klopt beide volgens mij niet helemaal, dus welkom aan het begin van weer een nieuw avontuur! Hebben elkaar eigenlijk nooit echt gesproken en heb je blog maar zo nu en dan gelezen, maar kwam voor mij altijd op het goede moment als ik ze las. Kom je even gedag zeggen wanneer je toevallig een keer langs Kilroy loopt?